Henry Penny was born in Yeovil on 5 November 1778, the son of Glove Manufacturer Henry Penny (1746-1796) and Drusilla née Chalkley (1746-1822). His parents had lived briefly in London, where they had two children who both died in infancy, before returning to live in Yeovil. Henry Jnr had one surviving sister, Elizabeth (who married John Highmore). Henry became a Glove Manufacturer, presumably working with his father and taking over the running of the business on his father's death in 1796. He also inherited land from his father as well as the advowson of West Coker. He bore the arms granted to the family in the sixteenth century. His memorial on the west wall of the north aisle of St John's church bears the arms. 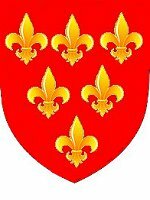 The arms were gules, six fleurs-de-lys or, 3, 2, 1 (on a red field, six golden fleurs-de-lys, three over two, over one). A serious fire occurred in 1802 in which many houses were destroyed. The following is an extract of a letter from Henry Penny to Mr R Donn of Exeter dated 1 October 1802 ".... it brake out last Thursday morning about 5 o'clock in a narrow lane called Little Lane (today's Tabernacle Lane) just behind Mr Edwards' house - it has destroyed 13 dwellings besides outhouses. Our family and Mrs Donn were greatly frightened, as might be expected, but however I have the happiness to acquaint you that they are all as well as can be expected and that the damage sustained by me is very little. I had no other prospect when I first discovered it but having my house burnt down about my ears and nothing but the very greatest exertions of those employed saved me. Mrs Donn has lost 4 tenements in Back Street (today's South Street) amongst which is Jno Hodges' - her own house is not the least damaged...."
In his will he described himself as a Banker but there is no corroborating evidence for this. Around 1808 Henry married Elizabeth Gould, who was born 24 July 1782 at Hendford, Yeovil. 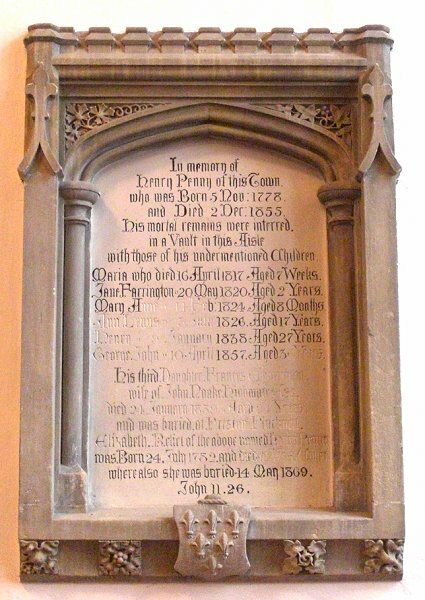 They were to have at least eight children, three of whom died in infancy and only one reached the age of forty; Ann (1809-1826), Henry (1810-1838), Frances Churchman (1815-1839, first wife of John Noake Highmore), Charles (1815-1884), Maria (1817-1817), Jane Farrington (1818-1820), George Henry (1821-1857) and Mary Anne (1823-1824). Henry Penny clearly had a status and played a role in the Yeovil community; he served as a member of the Vestry from 1813 and was elected Churchwarden in 1808 and again from 1816 to 1818. (His father had been a Churchwarden in 1776 and 1777). In 1830 he became a Town Commissioner. In 1832 Henry was included in the Voters List by virtue of owning a freehold property in the Borough - this was, almost certainly, the Rose & Crown Inn which had been the property of his father and grandfather before him. In 1833 he purchased Hendford House (today's Manor Hotel) from Rev. Arthur Johnson of Rampisham, Dorset. Johnson was the husband of Elizabeth Clark Daniell, who had inherited Hendford House from her father John Daniell the Elder, who had built the house in 1766. He was included in the 1841 Voters List by virtue of owning a freehold property in Hendford and this same year he was Custos of the Woborn Almshouse in Rackleford (today's Market Street). He served as Warden of the Woborn Almshouse between 1842 and 1844. In 1845 he was a member of the Committee of the National Day School in Huish. Between 1846 and 1849 Henry served as a Special Commissioner for the town. In 1850 Hunt's Directory listed him with an address in Hendford and he was also listed in the 1854 Burgess Roll. Henry retired from business in 1851 and died in Yeovil on 2 December 1855 aged 77. His remains were interred in a vault in the aisle of St John's church and his memorial in the church is shown below. Henry Penny's signature against the Vestry minutes of 3 March 1831. In the 1846 Tithe Apportionment Henry Penny was listed as the owner of the following properties and parcels of land. where also she was buried 14 May 1869.